“How is everything?” the waiter asks you three bites into your over-cooked pork chop. You choose courtesy over honesty, muster a phony smile and continue eating. You’re disappointed in your meal and the staff thinks you’re happy. Sending food back in a restaurant is considered gauche but it’s not nearly as obnoxious to waitstaff as people think. 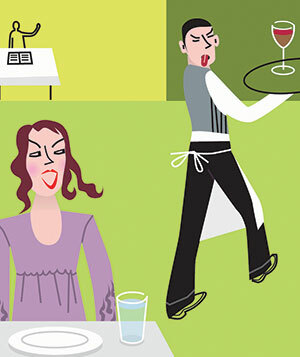 Most servers are more irritated by passive-agressive guests who hide their dissatisfaction than those who are forthcoming about it. Never suggest to the server that he try your food or that the chef taste it to confirm what you perceive to be wrong. We are professionals, you are not. Offering us your half-eaten food is a sure-fire way to send the negotiation into a tailspin. Try to communicate to the server in simple language what is wrong and what you’d like instead. Be as specific as possible. Ideally, phrase your concerns in question form. Making statements can sound presumptuous and will likely be misinterpreted. Don’t forget that the server is the only advocate for your needs in the kitchen, so it’s unwise to sour this relationship if you want results. No one who works in a restaurant ever wants you to be disappointed with your food. It makes our lives much easier when you’re satisfied. As servers, though, we have no control over the quality of what comes out of the kitchen. Miscommunications will sometimes result in your food coming out incorrectly, but don’t make assumptions. If something is wrong with your food, the staff can’t correct it unless you speak up. It’s inconvenient, we know, but at the end of the day it’s just food and it’s not the end of the world if something is wrong with it. Had an experience with this earlier today when I received a salad I didn’t order. It’s important to not sound accusatory to the server because a lot of times, the issue may not have been their fault/they didn’t deliver the food themselves so they couldn’t have known there was an issue ahead of time.